From the 1950s to the 1970s, the histories and criticism of modern and contemporary Chinese literature published in mainland China ignored Eileen Chang. In other words, for thirty years in the second half of the twentieth century, Eileen Chang was thrown into the dustbin of history. In addition to Eileen Chang, writers such as Hu Shi, Zhou Zuoren, Shen Congwen, and Qian Zhongshu were also thrown into the dustbin of history. 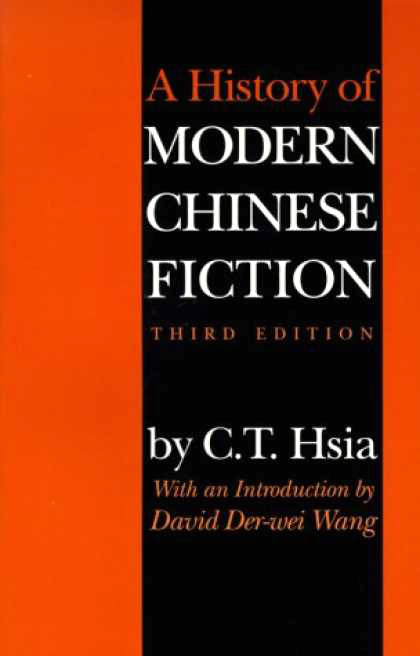 What C. T. Hsia’s A History of Modern Chinese Fiction managed to achieve was to rediscover some writers ignored by autocratic power and ideology. As it reintroduced these writers to the public and restored their reputation in the history of modern Chinese literature, it ushered in a new phase in the study of modern Chinese literature. In his book, C. T. Hsia praises Eileen Chang without any reservation. While describing the achievements Eileen Chang made in her fiction, he helps Chinese and foreign readers recognize her as a literary genius. This feat in the study of modern Chinese literature proves that critics and literary historians should not try to catch up with the latest fashion or repeat their predecessors’ conclusions all the time. Neither should they just write biographies and explications of well-known and well-studied writers or simply reshuffle the rankings of these writers. Instead, they should use their own knowledge and taste to discover truly valuable writers and works, especially those unusual writers and works ignored in contemporary times, and explain their achievements and significance. As for those well-studied writers, they should come up with their own objective evaluations rather than simply sing their praises. 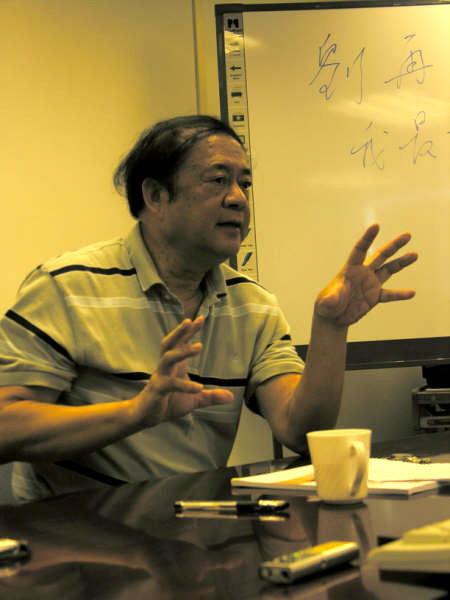 C. T. Hsia deserves our admiration not only because he has rediscovered writers such as Eileen Chang and Shen Congwen, but also because he has offered an entirely personal approach to the study of modern Chinese fiction. Although many of C. T. Hsia’s comments on Eileen Chang are remarkable, some of his statements still leave room for further discussion. For example, he is certainly right to point out that artistically Eileen Chang’s short stories (in his opinion Eileen Chang’s representative works “The Golden Cangue” and “Love in a Fallen City” are short stories, not novellas) are characterized by “rich imagery” and “profound exploration of human nature,” but his discussion of historical awareness and moral concern as the two features of the spiritual content of Eileen Chang’s short stories is not quite accurate. As a matter of fact, some of Eileen Chang’s novels and novellas, including “Xiao Ai,” Rice-sprout Song and Love in Redland, are characterized by historical awareness and moral concern. In contrast, her best works “The Golden Cangue” and “Love in a Fallen City” transcend historical awareness and moral judgment, which is precisely what makes these works such remarkable masterpieces. But in contrast to the world of stable moral standards and feminine fashions of the latter novel [Dream of the Red Chamber], Eileen Chang deals with a society in transition, where the only constants are the egoism in every bosom and the complementary flicker of love and compassion. Her imagery, therefore, not only embraces a wider range of elegance and sordidness but has to suggest the persistence of the past in the present, the continuity of Chinese modes of behavior in apparently changing material circumstances. In that respect her imagery has a strong historical awareness (396). She is little tempted to follow the dazzling fashions of present-day Western fiction–to pursue, for example, stream of consciousness to the neglect of weightier moral concerns (397). Miss Chang does not profess high-minded ideals, but this does not mean that her moral passion is in any way less intense than that of the professed didacticist. On the contrary, her registration of the inescapable pettiness and sadness of human endeavor is nearly always morally disturbing precisely because, given the human condition, she refrains from overt gestures of indignation or protest. A profound pessimist, she can afford at the same time to be a gay satirist, a good-natured critic of urban manners (414). In this century, Eileen Chang is one of the few philosophical writers to ponder deeply over abstract issues. Consequently, her works are permeated with a profound pessimistic feeling about life and the world. As a writer she is in possession of a unique perception. She sees a wilderness where other people see civilization, the powerlessness of human emotion where other people see emotional strength and possibilities where other people see impossibilities. “Love in a Fallen City” tells us that, instead of making progress, the world is gradually entering a desolate wilderness. Human beings, who dominate the world, are selfish and their behavior is controlled by endless desires that corrupt human nature and cause the collapse of love. These desire will continue to exist until time has run its course and the world has come to its end. Only then can humankind rediscover love and revive the innocence in human nature. What “Love in a Fallen City” shows is precisely how war, which pushes the world to its end, salvages love. Eileen Chang is pessimistic about life, human civilization and the world. To her everything in reality–successes, failures, glories, and humiliations–will turn into nothingness and death in the end. So only nothingness and death are real. Thinking about the vast span between the remote past and the distant future without being able to find a true companion in an endless universe, she cannot help feeling sad and tearful. Her works are shot through with a feeling of desolation and this feeling of desolation is uniquely premised on her pessimistic view of human civilization and human nature. What gives rise to her pessimistic view is a discovery she makes in life about a tragic paradox humankind faces: humankind creates civilization to escape from the wilderness, yet the desires stimulated by civilization push humankind toward another wilderness. Human beings strive to get freedom, but they can never reach this goal. As hostages to the world and to their own desires, they resemble those birds and butterflies painted on screens, for which imprisonment and death are only too real and who fly only in viewers’ imagination. Eileen Chang’s doubts about the meaning of life and her questions about the significance of human existence give her works a remarkable philosophical depth. With its social concern, modern Chinese literature is, in general, focused on condemning the injustices in society, but it does not ask questions about the meaning of human existence. Yet Eileen Chang masterfully describes many human tragedies as she asks these questions. Today I want to clarify my view by saying that what makes Eileen Chang a philosopher and not a historian is her ability to transcend the limits of space (urban areas) and time (history). In order to make my point, I borrow some views from Wang Guowei. According to Wang Guowei, there are two types of works in Chinese literature: one represented by Peach Blossom Fan and the other by Dream of the Red Chamber. He argues that “Peach Blossom Fan is concerned with politics, the nation and history whereas Dream of the Red Chamber is concerned with philosophy, the universe, and literature itself.” Similar to Dream of the Red Chamber, Eileen Chang’s works transcend the limits of politics, the nation, and history while remaining concerned with philosophy, the universe, and literature itself. Eileen Chang inherits her style from Dream of the Red Chamber. More important, she inherits fromDream of the Red Chamber an understanding about the dilemmas in human existence and human nature that lurk behind family activities, love relationships, and marriages. In so doing, she consciously or unconsciously demonstrates a concern for the fate of humankind, an everlasting concern that transcends the boundaries of space (Shanghai and Hong Kong) and time (her own era). At first glance, Eileen Chang’s best works, including “The Golden Cangue” and “Love in a Fallen City,” describe the details of family activities, love relationships, and marriages that occupy mundane life in places like Shanghai, but they in fact reveal the eternal mysteries in human nature that lie beneath the surface of life, mysteries of human desires for power and money. Human desires have something to do with politics, ethics, and history, but they are not the same as politics, ethics, or history. Specifically, Eileen Chang’s works deal with Shanghai and Hong Kong, but they are not just about Shanghai or Hong Kong, just as they are not just about the 1930s and the 1940s they describe. As powerful motivating forces, human desires exist in reality, yet it is difficult to explain them in logical terms. However, they can be fully portrayed in literature. The success of Eileen Chang’s early works comes precisely from her resistance to the restraints of history and ethics. She demonstrates her skills as a writer in expertly describing the workings of human desires. The conventional view holds Cao Qiqiao, the main character in “The Golden Cangue,” to be a terribly bad woman, but this moralistic judgment does not do justice to the story In fact, Qiqiao is a woman full of life and “The Golden Cangue” describes her changes in life. As the saying goes, “when a daughter-in-law becomes a mother-in-law herself after years of suffering at the hands of her mother-in-law, it is hard for her not to be cruel.” Qiqiao lives in anguish as a powerless daughter-in-law. Although she is married to a son of a wealthy family, she herself is a daughter of a lowly sesame oil vender, for which she is ridiculed by everyone. To make things worse, her husband is a ne’er-do-well. As she suffers class discrimination and sexual frustration, she represses her desires for years. However, her desires begin to run out of control once she becomes a mother-in-law and gains power. Subsequently, she gives rein to her desires and indulges herself in doing whatever she wants. She toys with her former secret crush (Jize), making him grovel in front of her before pushing him away. She knows what attracts this man is power and money, not her as a person. Subconsciously she is aware that the world is a machine running on power and money. So the golden cangue is a symbol of power and money. An autocrat who refuses to yield to anyone or make any compromise, she sees through everything, especially the golden cangue. The golden cangue harbors the ugliest and dirtiest aspects of the world, but it holds people under its spell and makes them debase themselves willingly. As a social product, Qiqiao derives her desires from a powerful male-centered society. As a result, she represents the desires for power and money in a male-dominated society, just as Grandmother Jia represents all the female rulers in Chinese political history and Ah Q represents all the deficiencies in the national character of the Chinese. What she represents not only exists in China but also in the rest of the world, because it is part of human nature and not limited to modern China. It is therefore more accurate to regard “The Golden Cangue” as a philosophical allegory about a society obsessed with power than to call it a historical record of modern Chinese society. In this allegory, Eileen Chang demonstrates her rare genius with her unsentimental revelation of the human world as an ugly network of power and money, a network in which human beings struggle as two-legged animals wrapped in the trappings of civilization and driven by desires. If we regard Lu Xun’s “Diary of a Madman” as an allegory about the cannibalistic features of traditional Chinese culture, we can regard “The Golden Cangue” as an allegory about people’s self-destructive as well as cannibalistic behavior in the network of power. In “The Golden Cangue,” the main character is transformed into an animal driven by desires for power and money, just as the main character in Kafka’s Metamorphosis is transformed into a beetle. Like all other masterpieces in world literature, “The Golden Cangue” conveys a multiplicity of hidden messages about the nature of the world and the nature of humankind, about the absurdity of the world and humankind, and about the unpredictability of fate and the unreliability of love. In its world, notions of truth and falsity, good and evil, cause and effect and right and wrong are irrelevant, just as they are in the remarkable world of Dream of the Red Chamber. As it overcomes the restraints of these notions, it portrays the dilemmas humankind will always face. Unfortunately, Eileen Chang herself did not realize her own genius. So she thought her success had come from her portrayals of ordinary people and harmony, which stands in contradistinction to aggression. (Where can we find harmony among the diabolic conflicts in “The Golden Cangue”?) She also believed that ordinary people represent society in its entirety better than heroes (“My Own Writings”). In fact whether this statement is true or not depends on whether the writer lives in an era of poetry or in an era of prose. According to Hegel, ancient times, in which heroes, ideals, wars, and revolutions served as fundamental symbols, can be called an era of poetry. In such times (ancient Greece for example), heroes of course represented society better than ordinary people. On the other hand, modern society is very prosaic in that it does not have heroes, ideals, or revolutions. In this prosaic environment, ordinary people can indeed represent society better. Eileen Chang did not understand that her success did not come from her skills in portraying ordinary people but from her ability to enter a philosophical, universal, and eternal world as she transcended the boundaries of politics, the nation, and history. In other words, she is able to move from the world ofPeach Blossom Fan to the world of Dream of the Red Chamber. It is precisely the philosophical, universal, and literary elements in “The Golden Cangue” and “Love in a Fallen City” that make them continue to attract people’s attention today. What these works describe is the way humankind lives and human nature exists throughout history, subject matter unrestrained by politics, the nation and history, or by moral standards. At first glance “The Golden Cangue” supports the notion of retribution, since selfishness, cold-heartedness, and domestic tyranny all get their just deserts and even Qiqiao’s children suffer because of her behavior. So in that sense it touches some moral issues. However, at a deeper level it deals with irresistible human desires and the way human desires subtly control people’s fate. Here Walter Benjamin’s comment on Goethe’s novella “Elective Affinities” can shed some light for us. “Elective Affinities” describes an extramarital affair. In this novella, the male protagonist Eduard falls in love with his wife’s niece Ottilie and, in the meantime, his wife Charlotte falls for a friend of his, a captain. As they pursue sexual gratification, their son is drowned in an accident. The death shocks everyone. Burdened by a guilty conscience, Ottilie commits suicide. Eduard also dies in sorrow. Although Charlotte and the captain manage to live on, they always feel shadowed by death and, no matter how hard they try, they remain unable to overcome their guilty feelings. Many critics argue that in this work Goethe emphasizes the sanctity of marriage and the immorality of extramarital affairs. Instead of passing another moral judgment, Benjamin focuses his attention on the irresistibility of fate reflected in this story about an extramarital affair. He argues that the subject matter of “Elective Affinities” is not marriage, because from the very beginning the ethical force of marriage begins to recede like a wave receding from a beach and, in the end, such a force is nowhere to be seen. In this work, marriage is neither an ethical issue nor a social issue. Moreover, it has even less to do with the behavioral pattern of the bourgeoisie. As the marriage system disintegrates, all the elements in human nature begin to show. As a result, myth remains the core of the work. In Benjamin’s view, the tragedies experienced by the characters in “Elective Affinities” are neither moral tragedies nor historical tragedies. Instead, they are mysterious philosophical and universal tragedies, tragedies human beings cannot control or resist. That is what he means by the word “myth.” If we read “The Golden Cangue” and “Love in a Fallen City” from Benjamin’s point of view, we can see their rich philosophical connotations. I do not like to rank writers when dealing with the history of literature. Granted, critics can evaluate the different qualities of different writers, but it is difficult to compare some outstanding writers qualitatively, because each has his or her own unique characteristics. For instance, whom should we vote for if we are supposed to choose the most outstanding writer from among Lu Xun, Eileen Chang, Shen Congwen, Li Jieren, and Xiao Hong? In dealing with this problem, I am inclined to agree with Hugo that critics should refrain from comparing master writers because they are equally outstanding. If forced to make such a choice, however, I could certainly choose between Lu Xun and Eileen Chang and, in the end, vote for Lu Xun. The reason for my choice is that Lu Xun put his genius to full use while Eileen Chang did not. A genius can only display his/her brilliance when all his/her talents are fully utilized. Unfortunately, Eileen Chang abandoned her unique aesthetic approach right after reaching the peak of her career. This tragic turn put an end to the most outstanding phase of her career and made her a genius who failed to tap all her potential. In twentieth-century China, only two writers had a genuine sense of despair: Lu Xun and Eileen Chang. When despairing, Lu Xun tried to overcome his despair and, as a result, his writings are characterized by anger and frustration; whereas Eileen Chang just felt despair and, as a result, her works are characterized by a feeling of desolation. Lu Xun saw through life, but he also confronted life and struggled hard with it, so his works display a masculine sublimity; whereas Eileen Chang could see through life but did not have the courage to face it. As a result of her constant attempts to escape into the details of mundane life, her works display a unique feminine sensibility. Although these two writers portray the existential and mental state of the Chinese people in masterful yet different ways, Lu Xun obviously goes much further than Eileen Chang in his spiritual exploration. Eileen Chang’s tragedy began with “Xiao Ai” (1950) and Tender Age (Shiba chun, 1951), two works written at a time when China was going through a political transition. Compared with “The Golden Cangue” and “Love in a Fallen City,” “Xiao Ai” and Tender Age can only be considered second- or third-rate works. Yet the beginning parts of these works still demonstrate Eileen Chang’s brilliance. In “Xiao Ai,” Eileen Chang manages to describe the suffering of those women living at the bottom of Chinese society in a particularly moving manner. Nonetheless, the plotlines, especially the endings, of these two works obviously try to meet a political demand. Since they do not falsify life, it is hard to say whether the author made such attempts against her conscience, yet it is undeniable that these attempts indicate the dilemmas Eileen Chang faced as a writer who wanted to have nothing to do with revolution. In the past, Third Mistress had a maidservant, a smart girl named Lianxi who was bought together with Xiao Ai and who was a few years older than her. Lianxi’s later escape left a deep impression on Xiao Ai, still young at the time. Then Xiao Ai heard that someone ran into Lianxi in the street and found out she had become a streetwalker. It was said that she met a bad guy who lied to her and sold her under the pretext of sending her to work in a factory. When Xiao Ai heard the story, she felt sad, but at the same time she also gained a better understanding of the cannibalistic society. As he listened, Jinkui fell silent for a while before he said, “I don’t think you can blame your parents. They must have been forced to do what they had to do. Since you have grown up in the Xi household, of course you don’t understand the situation in the countryside.” He then told her how peasants were exploited and how they starved even when they had a good harvest and how they had no choice but to sell their children to pay back the high-interest loans they had to take out when they had a poor harvest and failed to pay their rent on time. It was the last spring in which the Jiang bandits still controlled Shanghai. In May the city was liberated. . . . After liberation, Jinkui threw himself into study with all his enthusiasm. Just as he did right after he met Xiao Ai, he always carried a book with him wherever he went. He would read on the trolley on his way to the printing house and on his way home. At home he would often explain “new democracy” and the history of social development to Xiao Ai and others. Xiao Ai liked to listen to his discussions. To her, theoretical talk was a kind of decoration for men, so she always smiled contentedly as he talked, without trying too hard to figure out what he meant. At first, what she felt most keenly was that prices had been stabilized and life had become peaceful. However, since human beings were forgetful animals, not long after starting this good life, she gradually forgot the nightmarish past. In “Xiao Ai,” Eileen Chang resorts to clear-cut political and moral judgments: the old society was cannibalistic, while the new society saves people; the old society was a nightmare, while the new society is brimming with light; in the past, people were exploited, but now they are liberated; and the old society was evil, while the new society is good, with the Jiang bandits as the source of all evils. As a witness, Xiao Ai, with all her wounds, reminds people that they should not become “forgetful animals” that fail to keep in mind the nightmarish cannibalistic old society and how much the working classes had suffered in the past. “Xiao Ai” is written in an unsentimental style, but its condemnation of the old society is very harsh and, as a result, it can be seen as a classic text for class education and for contrasting past misery with present happiness. In “Xiao Ai,” Eileen Chang does not distort reality, and we, for our part, should not pass any judgment on her moral and political judgments. But one thing is clear in the political orientation of this work: Eileen Chang is no longer a writer in search of eternal literary and aesthetic values. Given the politicization of this 1950 work, Love in Redland (written in 1954 in Hong Kong) is just a further development with an entirely different political direction. What I want to show with my detailed discussion of “Xiao Ai” is that Eileen Chang’s genius was ruined by historical changes, not by the United States Information Agency. The new era no longer provided a refuge for any writer who wanted to transcend the times. Whether she lived in Shanghai or Hong Kong, Eileen Chang was forced to deny her old self and, as a result, a tragedy took place in her career. In the middle of the twentieth century, Eileen Chang and Ding Ling, two outstanding female writers, experienced the same tragedy in entirely different political situations. This shared tragedy was a typical tragedy of aesthetics rather than a tragedy of politics. Ding Ling was a talented writer who emerged on the literary scene after the May Fourth movement with outstanding works such as “The Diary of Miss Sophia” and “When I Was in Hsia Village.” Eventually, however, she wrote The Sun Shines on the Sanggan River to carry out an order and to flesh out the policies of the Land Reform movement. Eileen Chang had an entirely different political stand, yet in her career, from the writing of “The Golden Cangue” and to the writing of Love in Redland, she followed the same tragic path. In spite of their opposite political standpoints, Eileen Chang and Ding Ling shared the same motivation and the same way of writing when they wrote about the “Redland” and the “Red Area,” respectively. Driven by political considerations, they both used fiction as a political tool and tried to sound a clarion call for their times. This interesting phenomenon in the history of modern Chinese literature can be regarded as the same tragedy played out by two different writers from opposite political directions. In this way, I try to describe how humankind has lived throughout history so that I can provide a lesson for the present. I do not know if I have succeeded in carrying out my plan. Generally speaking, I do not have the ability to write anything that can be called a “monument to its time.” Neither will I try to write such a work, since it seems that the source materials for such a work are still too scarce. Focused only on the small matters among men and women, my works have nothing to do with war or revolution. I believe human beings are more innocent and freer in love than in war or revolution. Because of their nature, war and revolution often need intelligence more urgently than they need emotion. Consequently, those works about war or revolution often fail because their artistic elements are overwhelmed by practical considerations. In contrast to the freedom in love, coercion characterizes war and in revolution people often force themselves to participate. The above statement, made in December 1944, shows how clearheaded Eileen was at the time. She tells her readers that: (1) she wrote about things that exist throughout history, namely, eternal subjects that refuse to be monuments to their times because they transcend their specific historical periods (a clear indication that Eileen Chang’s early works are marked not by their “historical awareness” but by their resistance to historical awareness; in other words, they are marked not by an awareness of a specific historical period but by an awareness of eternity); and (2) this standpoint enabled her to free herself from the restraints of weighty, fashionable subjects such as war and revolution and to choose to write about things that exist eternally, things such as the love between a man and a woman. At that time, it took a strong belief in art and strength in character to keep a distance from war and revolution and to reject the historical trend and fashionable subjects. As we reread the early works Eileen Chang wrote in Shanghai, we realize that she indeed keeps a distance from politics. Without making any moral judgment on society, life, or the characters, these works have neither heroes nor villains. Their characters are all ordinary people who struggle to exist. As they make calculations in their own interest, they become rather worldly. As for the female characters in these works, they are often selfish women living in a mundane world, with tricks up their sleeves to deal with the entanglements of love. Feeling lost in a fast-changing society, these women are poles apart from the female revolutionaries. They never want to change society. All they manage to do is to carefully struggle with the details of life. As Eileen Chang says in her essay “Changing Clothes”: “Unable to improve their social environment, people can only create their bodily environments–namely, clothes, since we all live in our clothes.” As a result, for these women, clothing becomes a refuge where they are sheltered from the hardships in life and can take a break. With this statement about her stand as a writer (written in 1944 in “My Own Writings”) in mind, we are surprised to find that ten years later, as she wrote Love in Redland in Hong Kong, Eileen Chang had become an entirely different writer. Instead of writing about subjects that exist throughout history, she wrote about the tremendous social changes of the time. Instead of avoiding war and revolution, she focused her attention exclusively on war and revolution. Instead of resisting the dominant historical trend, she embraced it, followed it, and tried to reflect it in her novel. Eileen Chang’s early works are more interesting than those she wrote later in her career. It is a remarkable phenomenon that she reached the peak of her career soon after she began writing as a young writer. Unfortunately, she did not fully recognize the significance of her unique artistic approach and, as she wrote Love in Redland and Rice-sprout Song, she soon stopped pursuing her goal and stopped thinking about life and the universe in an unsentimental, philosophical manner. Her early works excel in ruminations on eternal questions and stay away from contemporary issues. In contrast, political considerations replace the aesthetic concerns and philosophical reflections on eternal, universal questions of her later works. Instead of using her own unique imagery to portray the familiar urban areas, she began to use popular symbols to describe the unfamiliar countryside. In the meantime, instead of conducting subtle aesthetic exploration of her characters’ minds and souls, she chose to illustrate their personalities and fates according to foregone conclusions. In short, she gave up her transcendental aesthetic standpoint to embrace a vulgar standpoint, which stunted her development as a precocious writer and prevented her from becoming a first-rate master. I like Eileen Chang’s works, but I do not want to create a myth about her. It took me more than ten years to free myself from the myth of Lu Xun as a vengeful fighter that I had once believed in. I do not want to be seduced by another myth. Any genius has his/her own flaws. I can understand Eileen Chang’s narcissism, masochism, worldliness, and her final self-seclusion, but I do not admire these traits. Just as I cannot accept Lu Xun’s recalcitrance, I cannot accept Eileen Chang’s vulgarity and cynicism.
. The first part of this article was written in October, 2000. The second part was written in November, 2001 on the campus of the City University of Hong Kong. The entire article was first published in Shijie (Scope) no. 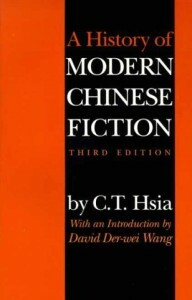 7 (2002).
. All citations come from A History of Modern Chinese Fiction (New Haven: Yale University Press, 1971).
. See “Another Discussion of Eileen Chang” in my book Xi xun guxiang (Looking for a homeland in the West) (Hong Kong: Tiandi tushu, 1997), pp. 291-292.
. See David Der-wei Wang, Xiaoshuo Zhongguo (Fiction China) (Taipei: Maitian, 1993), pp. 327-335. .See my book Fangzhu zhu shen (Exiling the gods) (Hong Kong: Tiandi tushu, 1994).
. See my article “Another Discussion of Eileen Chang,” in Liu Zaifu, Xi xun guxiang (Looking for a homeland in the West) (Hong Kong: Tiandi tushu, 1997), pp. 291-292.